Trade ministers from the U.S. and 11 other nations from both sides of the Pacific will meet in Hawaii next Tuesday to attempt to finalize what would be the world’s largest regional trade and investment agreement: the Trans-Pacific Partnership. But while the pact has general public support in most of the countries involved, there are also deep partisan divisions in some of them over the issue. This partisanship suggests that TPP, one of President Barack Obama’s principal foreign economic policy legacies, is not yet a done deal. TPP involves a dozen Asian-Pacific nations, nine of which Pew Research Center surveyed earlier this year. Among those publics, a median of 53% think the deal would be good for their country, while a median of 23% say it would be a bad thing. In the U.S., public backing for the treaty, which the Obama administration regards as a key element of its “pivot” to Asia, is tepid at best. Americans support TPP by a 49%-29% margin, though nearly a quarter offer no opinion. The strongest support for the agreement is found in Vietnam, where 89% of the public backs the potential accord. The weakest support is in the U.S. and in Malaysia (38%). The greatest outright opposition is in Canada (31%), Australia (30%) and the U.S. And about one-in-ten Americans (12%) and 31% of Malaysians say they haven’t heard of the negotiations. There is a partisan divide on TPP in a number of key nations. In the U.S., a modest 51% of Democrats think TPP would be good for the country, despite Obama’s strong push for the pact. Only 43% of Republicans share that view. Similarly, in Canada, 70% of supporters of the ruling Conservative Party back TPP, but only 60% of Liberals and 42% of adherents of the New Democratic Party agree. In Australia, two-thirds of backers of the ruling Liberal National Party/Country Liberal Party coalition (67%) support TPP, while just 44% in the opposition Labor Party favor the agreement. In four of the largest economies negotiating TPP, there is also a gender gap in public attitudes toward the deal. 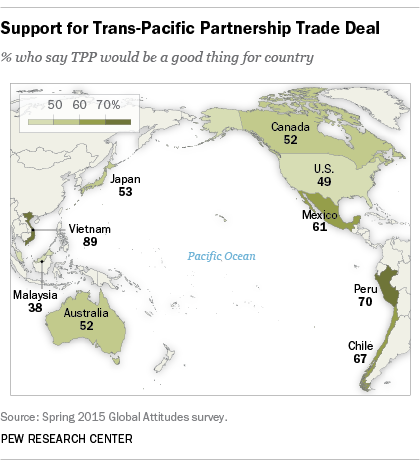 In the U.S., 53% of men favor TPP, but only 45% of women agree. Six-in-ten men in Japan think the trade deal would be good for the country, while only 46% of Japanese women agree. In Canada, the gender gap is 13 percentage points: 59% of men favor a deal, versus 46% of women. And in Australia it is 7 points (56% to 49%). In a number of participating nations, a generation gap in TPP support exists as well. The largest difference (24 points) is in the U.S., where Americans ages 18 to 29 (65%) are much more supportive than those ages 50 and older (41%). There is also a 19-point difference between young and old in Mexico, a 15-point gap in Australia and a 10-point difference in Peru.